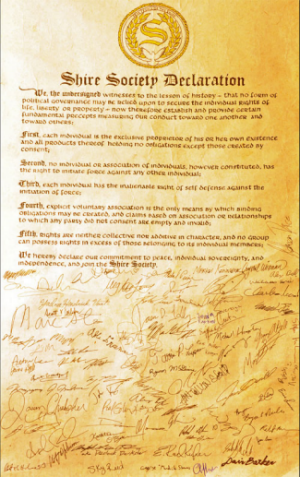 Q. I’ve signed the declaration – how do I move together with other Shire Society people? A. While it is true that the Shire is a state of mind, it is also a physical location. It is commonly known as “New Hampshire”. It is within this arbitrary geographic land mass that the idea of the Shire was created. Thousands of people who love liberty are coming to this place every month and joining together to stand for freedom. Moving to the Shire is as simple and as complex as any move. For some, it means moving businesses and families while others are couples or single people with varying levels of belongings. Some sell lots of stuff and others pack it all in a truck. Some move with very little, but it’s recommended you be prepared to take care of yourself upon arrival. Shire Society people tend to be generous, but aren’t interested in being used. In short, freeloading isn’t likely to get you very far. It’s smart to move with a “nest egg” to insure your maximum ability to settle into a new locale. Q. When should I move to the Shire? A. As soon as possible. Thousands of liberty-loving people have already moved here, and more are moving every month. As soon as you are financially able and have cut the necessary strings tying you down where you are, come on up! You’ll find housing and jobs subforums over at the Shire Society Forum, as well as forums where you can ask questions of those already here. Q. To where should I consider moving in the Shire? A. You can certainly move to anywhere within they physical land mass known commonly as New Hampshire, but it makes the most sense to move around the areas of the highest concentrations of Shire Society people. Two of these areas are Keene and Manchester. NEW: Now you can join the Free Streets Project and move to the same streets as other liberty-loving folks! Q. Will signing and moving protect me from the aggression of the people calling themselves “the state”? A. WARNING: The Shire is currently occupied by a large gang known as “the state”. This gang provides a variety of services, wanted and unwanted, as a means of covering their coercive, monopolistic method of “doing business”. Shire folk should be aware that they could be the subject of some of these unwanted services, and remain peaceful. Hopefully the people calling themselves “the state” will repudiate their former ways and renounce advocating and using aggression against their fellow peaceful man, and join us in the Shire. Joining and moving can’t guarantee your safety, but you didn’t really think signing a piece of paper would stop armed criminals, did you? The best way to stop the violent monopolists is to stand peacefully together – here.